We’ve had a busy few days and even with the best of intentions, I didn’t actually manage to turn on my computer for almost a week! We signed up for a season of AFL and had the summer season, indoor soccer finale. When I say “we”, I mean my son, but as I’m his taxi-driver, I claim it too. The “Thunderbolts” as they called themselves, were a mix of kids from school. One of the mums put the call-out for anyone that was interested in a team. Soccer experience wasn’t necessary, but being one of the younger ones of the year (only turning 9 this year when most of the year are turning 10) was the only stipulation. Admittedly, they weren’t the most co-ordinated team of players, but they were enthusiastic and we all had a lot of fun each Thursday evening. AFL is all new to me. It’s not a sport which I follow, or understand, but we thought it would be fun to give it a try. Who knows, we might be one-eyed supporters before long. We spent Saturday going through the kids rooms and managed to fill a dozen bags of clothes, books, toys and things which were donated to charity. I decided to attempt the #40BagsFor40Days project which where you fill 40 bags and donate them during the 40 days of Lent. I wish I'd actually counted them from the beginning, but I figure we're close to half way there and I haven't even started on the kitchen, garage or sewing room! 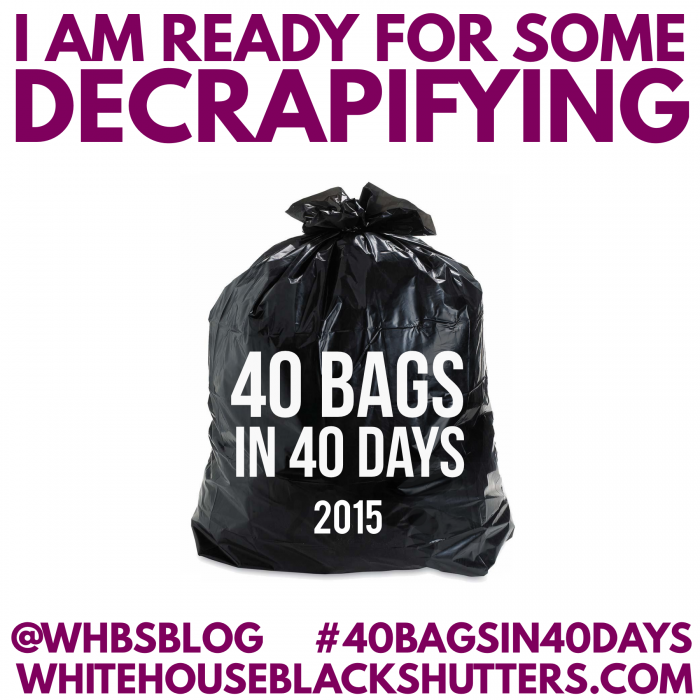 Did you join the 40 bags project? How are you going with it? Sunday was family fun day. We were invited along to an event in the city to learn about Woolworths all new Domino Stars campaign. Yes friends, more things for the kids to collect when we do our grocery shopping. This time, rather than collector cards, it's dominoes. 44 dominoes starring loveable characters from popular Disney/Pixar films including Toy Story, Monsters Inc, Finding Nemo, Up, Brave, The Incredibles, Wall-E, Ratatouille and A Bug's Life. It was such a fun morning at the city cinema complex with face painting, Disney characters, and a giant domino game. We were then ushered into the theatre and got to watch Toy Story on the big screen. I have seen Toy Story about a thousand times, but never actually on the big screen. Can you believe it's the twentieth anniversary of this classic film? 20 years! Where has the time gone? Keep an eye out for the Domino Stars collectibles at Woolworths stores from 4 March 2015. Now, what is a day in the city without making the most of Family Fun Day? This is the day that we only pay $2.50 for the whole day of public transport around Sydney. Honestly, it's such fun and there are sooooo many people around the city, making the most of it too. We caught a train (for fun) and then jumped on a ferry (again, just for fun). Cruising around Sydney Harbour on a gorgeous Sunday afternoon is just the most wonderful experience. We love playing tourist. Taking photos. Eating ice-cream. The weather turned quite nasty by the time we made it back to Circular Quay. The day started out quite hot, with temperatues in the high 30's - in Sydney, this usually means a storm in the afternoon. The sky was darkening as we headed to shore and we managed to get on to the train before the first few drops fell... but by the time we arrived at our final station (10 minutes later) it was pouring with thunder and lightning. We made a rather slow run, waddle, puddle jump, back to where we'd left the car parked at FlyBoy's work, but were completely saturated. Completely!! Sure we were wet, but it was a beautiful and certainly memorable day... and that's what it's all about, right? Creating memories. Have you created some fun memories lately?